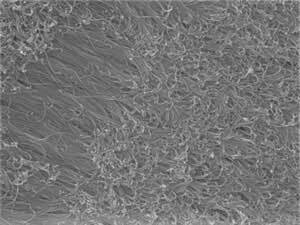 (Nanowerk News) Adjustments to sulfur-containing molecules have enabled researchers to precisely control the growth of gold nanowires, which are potentially useful in various applications including biosensors and catalysis1 (Small, "Effect of thiolated ligands in Au nanowire synthesis"). The ligand binds strongly to any exposed part of the gold nanowire, and interactions between ligand molecules keep them densely packed on the wire’s surface. This prevents gold atoms in solution from sticking to the sides of the wire, so that they only join the growing wire at the junction between the wire and the wafer. Consequently, the gold nanowire grows like hair sprouting from a follicle, rather than forming a sphere. “This active surface growth mechanism is fundamentally different from other gold nanowire growth strategies,” says Yu. Changing the position of the chemical groups in the ligand also had a dramatic effect on nanowire growth. In 4-MBA, the thiol group is on the opposite side of the molecule to a carboxylic acid group. If these groups are side by side, as in 2-MBA, the carboxylic acid interferes with the packing of the ligands around the nanowire, allowing gold atoms to sneak through and form short, lumpy nanostructures. A mixture of 4-MBA and 3-MBA ligands allowed some gold atoms to stick to the sides of the nanostructure as it grew, creating a tapered nanowire. Another ligand, 2-naphthalenethiol, made the gold nanowire extremely water repellent — a potentially useful property in functional surfaces. The team hopes to use this approach to make other gold nanostructures, and explore how they can be used as high efficiency electrodes in flexible sensors, or as catalysts to turn carbon dioxide into useful products.